Fig. 1. 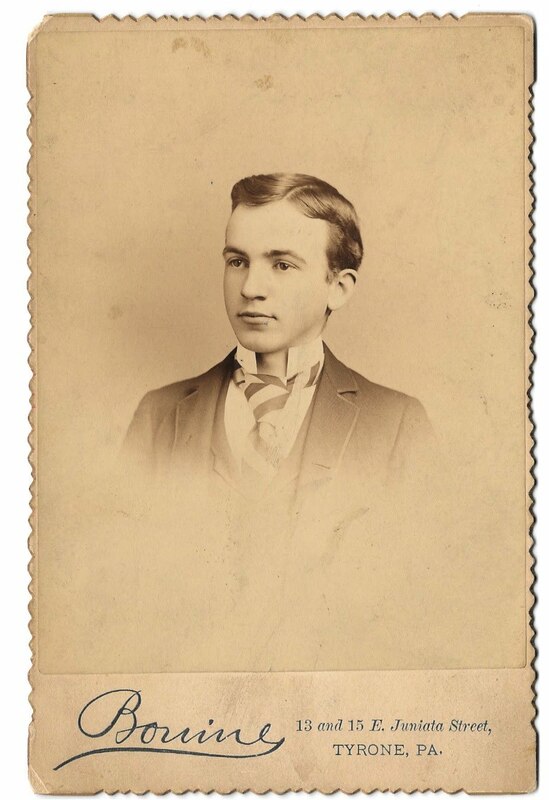 Photograph of thirteen year old Joseph Farran Zerbe 1884, an exemplar for our youth today, already four years an avid stamp, coin and curio collector since the age of nine. Joseph "Farran Zerbe" (1871-1949), was born on a Sunday and died on a Sunday. And we shall see, as the saying goes, "Sunday's child is full of grace." He was born on the first Sunday after Easter, April 16, 1871 at Tyrone, Pennsylvania, son of James Albert Zerbe (1842-1880), an Express Messenger, and Bridget Mary McAvoy (1852-1926). He lived on Lincoln Avenue, Tyrone, Pennsylvania, and later on in St. Louis, Missouri; Portland, Oregon; Columbus, Ohio; East Orange, New Jersey; San Francisco, California; and at the Chase branch 18 Pine Street, New York, New York; personal residence, 14 East 28th Street, New York.. He was educated in public and in private schools. He was a newspaper delivery boy for the Tyrone Daily Herald from 1880 to 1889. As the legendary story goes when at age eleven in 1882 a customer paid him in a French 50 centimes pièce, which was refused as a cash deposit by his local bank. This, purportedly whet his curiosity setting him on a course into the study of foreign numismatics. The veracity of the story is in the credibility of the French coin intermingled among the specie in circulation at Tyrone, Pennsylvania. "The 1870 U.S. Census counted 115,260 U.S. residents born in France, with the largest numbers in New York, Ohio, Louisiana, Georgia, and Pennsylvania." The French presence also seems to have influenced young Zerbe giving him a penchant for foreign languages, especially French, as we shall soon see. However, regarding the veracity of the story beyond the credibility of the French coin in circulation it seems to be more of a lore, or as the anglers say, a lure to draw you in. And drawing in was what this tale was intended to do by drawing in large crowds to his traveling exhibition beginning in 1907. When this tale was spun as a yarn is not as relevant as realizing the pure genius Zerbe had as a clever businessman and numismatic aficionado to lure people into, not merely his show, but into the love of numismatics. His aspirations to bring everyone into numismatics were global. He loved all countries, peoples, cultures, and customs, and the type of numismatic phenomenon they produced. Zerbe was in love with global numismatics reflecting his love for the brotherhood of man. The name of the publisher "Coin Zerbe" is most probably a double entendre pun in English and French since "coin" in French means "corner" alluding to his corner store, and in English "Coin Zerbe" alludes to his being a coin crank or maniac. From this awareness we see his passion for study led him to investigate the etymological root of the English word "coin," learning that it is derived from the French for "corner" and is variously interpreted by authors as to why. The Cyclopedia of Abraham Reese, under the word "TIN", for example, relates how the duke of Cornwall would have the tin from his mines formed into bricks. A corner of each brick of tin would be cut off and assayed for their purity, and if found sufficiently pure the bricks would be stamped with the arms of the duke. An article in Merchants' Magazine and Commercial Review, Vol. V (1841), Dr. Jerome Van Crowninshield Smith (1800-1879), "Art. II. --Coinage of the Precious Metals," on page 324, reports : "Coin is considered by some antiquarians to be a corruption, and has reference to many varieties of ancient coins, which were ordinarily square, and consequently distinguished by their corners." Dr. Smith of Boston was America's first great numismatic historian and Zerbe may have had access to his wonderful writings about coinage and its history. Regardless, it was well-known during the nineteenth century in America that the English word "coin" was derived from the French word for "corner" for whatever explanation each dictionary or essay may have provided to young Zerbe's thirsty mind. What we see is how Zerbe's clever mind worked, and puns based on language anddouble entendre seem to be among his favorite patterns of thinking. On January 25, 1889, it was reported in his local newspaper that our coin crank narrowly escaped being run over by the cars on Spring Street, Tyrone, Pennsylvania. 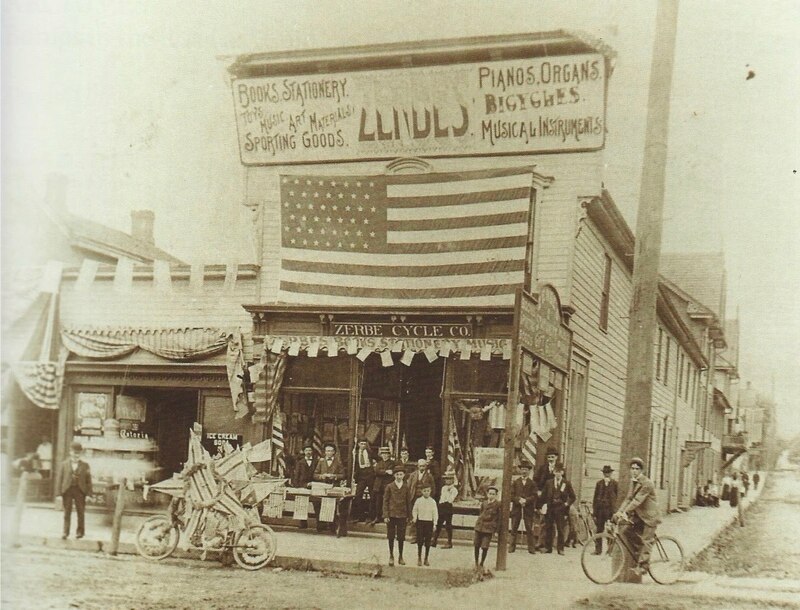 At this time he owned a stationery store, the "Zerbe Cycle Co.", Books, Stationery, Pianos, Organs, Toys, Music, Art Materials, Bicycles, Sporting Goods, and Musical Instruments, on the corner at 1123 Pennsylvania Avenue, Tyrone, Pennsylvania. He sold just about everything marketable in that store and ran seasonal ads at Christmas vending toys, candies, and various items for stocking stuffers. His advertisements or announcements appeared weekly in the local newspaper. He was also very active in the town and his store was oftentimes used as a site for managing ticket sales for various trips. Fig. 2. A photograph of "Zerbe's Corner Store" or as the French say, "Coin Zerbe", Tyrone, Pennsylvania, circa 1895. This photograph of the "Zerbe's Corner Store" gracing a street corner is also published in Issue No. 1, ANS Magazine 2016. Photo pending courtesy of Bob and Viola Dollar of the Tyrone Area Historical Society. In June 1889 he became the financial agent of the Tyrone Gazette, a local political paper edited by W. Scott Wilson. In November 1889 he had a violin playing cat posed in his store window that took notice in the Tyrone Daily Herald. Certainly this jouet is an effigy taken from the Mother Goose nursery rhyme "Hey diddle diddle the cat and the fiddle," or perhaps, that published a century later in Thomas Middleton's (1580-1627) "The Witch" (c. 1610), who conjures a cat playing a violin. Zerbe loved the curious, the fascinating world of wonder that gave his corner store the air of the old curiosity shop and as we shall soon see bought and sold stamps and coins among his wares. Zerbe did not isolate his business to his corner store. He also ran a news service. "The Farran Zerbe News Agency" was an active enterprise at Altoona, Pennsylvania from 1889 to 1890. "Farran Zerbe will buy, give information and pay a premium on old, curious and foreign coins, paper money, stamps, etc." In September 1890 he became the editor of the Tyrone Times during the absence of its regular editor Mr. Nissley, who went honeymooning. In 1893, according to his nephew Jerome McAvoy, Farran Zerbe exhibited his collection of Moneys of the World at the "Columbian Exposition" Chicago World's Fair, Chicago, Illinois, and was in charge of the government exhibit on the commemorative coins issued for the occasion : Isabella Quarter and Columbus Half Dollar, and according to several numismatists Zerbe both publicized and sold them. Fig. 3. Tyrone Daily Herald, Friday, September 29, 1893, page 3, typical weekly advertisement run by Zerbe for his corner store in the local newspaper. Fig. 4. Public notice about Zerbe's stamp collection from his early boyhood in the Tyrone Daily Herald, Thursday, March 30, 1899, page 9. This casts a new light on the old worn out story about the French 50 centimes being the initial spark that got him started on an interest in coins that lead to his obsession with world money. Nevertheless, another story published decades later in the Wilkes-Barre Times Leader, the Evening News, Saturday, October 15, 1932, page 12, relates how he was shorted in change at age 10, not 11, being given the 50 centimes coin in lieu of an American dime. This perpetuated the legendary story how he got started as a coin collector and built the Moneys of the World Exhibit. 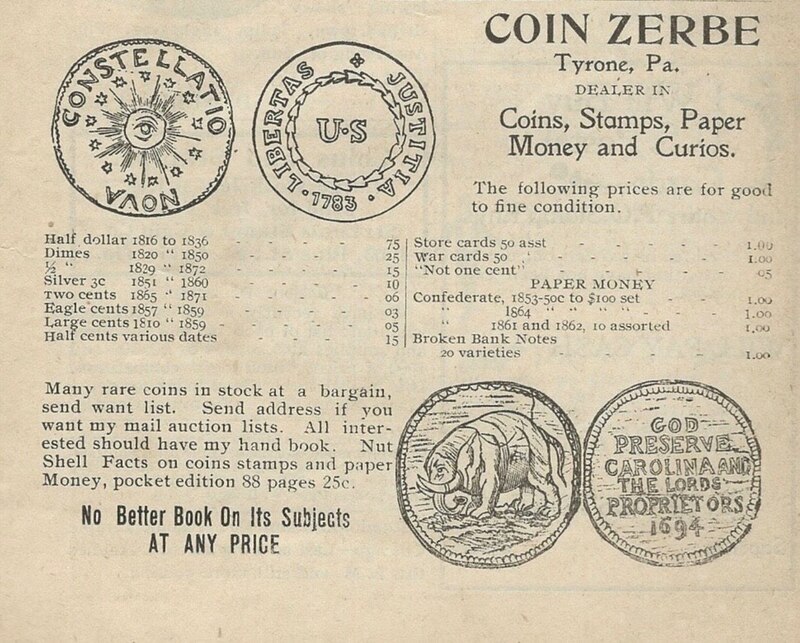 Regardless, Zerbe had a Stamp Store at Tyrone selling postage stamps for collectors where the Post Office is today, according to a notice published posthumously in the Tyrone Daily Herald, Saturday, January 7, 1950, page 4. Fig. 5. 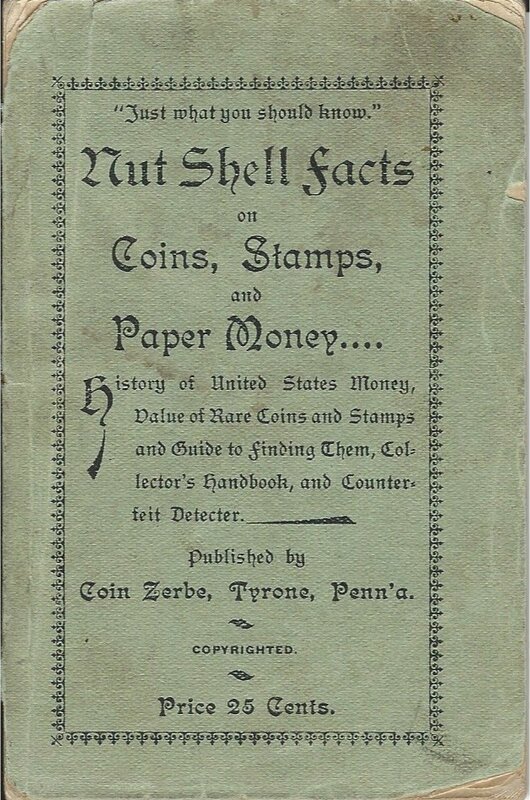 Nut Shell Facts on Coins, Stamps and Paper Money (Coin Zerbe, Tyrone, Pennsylvania, August 1899). The 88-page booklet measuring 3-1/8" x 4-3/4" or a 32mo. sold for twenty-five cents. The Altoona Tribune, Saturday, August 19, 1899, page 8, ran the first public notice about the book giving it the title "Just What You Should Know". He also advertised the book in The Bookseller, Newsdealer and Stationer, Volume 10, September 1, 1899 describing it as 84-pages and offering it to dealers at the wholesale price of 15 cents. Curiously, in Book News, Vol. XVIII, No. 206, October 1899 , page 75, his book is described as 76 pages and also offered at 15 cents or 17 cents by mail. It was similarly listed in Publishers Weekly, Vol. 56. The book was the result of nearly two decades of collecting and study. This was the book that B. Max Mehl had to contend with beginning in 1903 and eventually triumphed most probably because of Zerbe's book's small size and not the price. Courtesy Lupia Numismatic Library. Fig. 6. 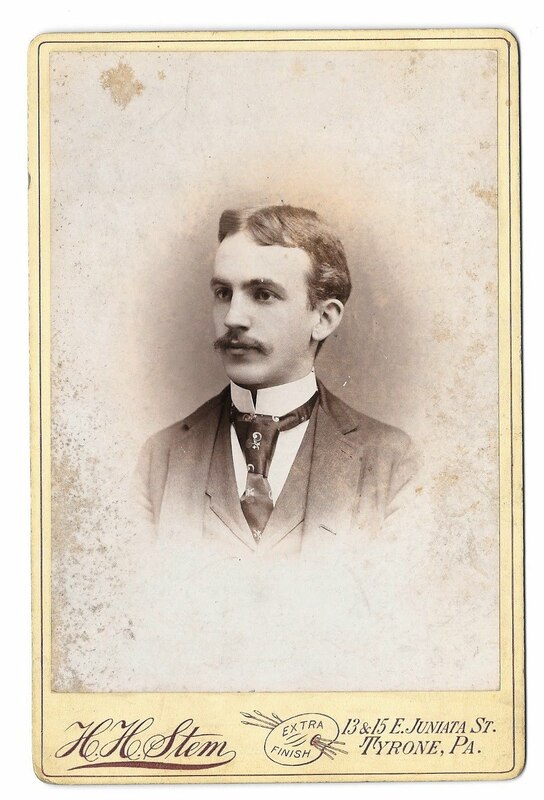 Farran Zerbe c. 1899 taken about the time he published Nut Shell Facts on Coins, Stamps and Paper Money. "Farran Zerbe has in his possession temporarily and is exhibiting a genuine silver dollar of the coinage of 1804." Fig. 7. Earliest known Zerbe business stationery. Although no longer in business he used up the stock of his old business envelopes since he was well-known to the postmaster and was sure to get his mail though the store was now closed. 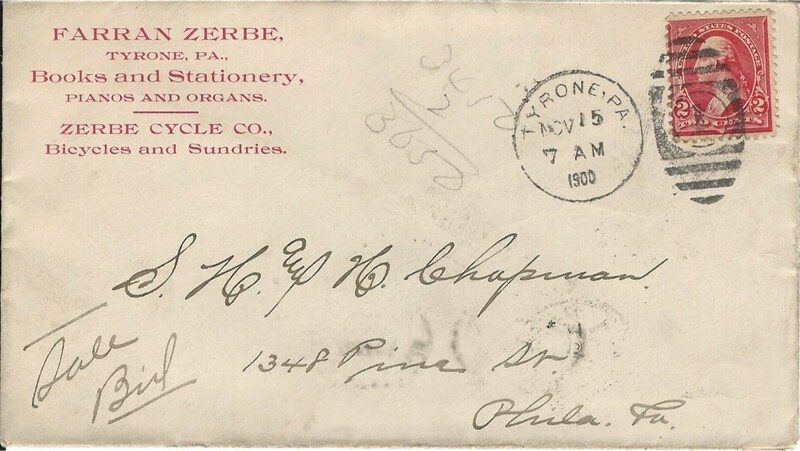 Top letter : This is a letter sent with bids on the Dr. Maris coin auction sale to the Chapman Brothers duplex postmarked November 15, 1900, Tyrone, Pennsylvania. The Chapmans annotated both the front and back. Here seen lower left corner "Sale Bid" and top right 34.50 + 2 = 36.50. Bottom Letter : Postmarked December 27, 1900, Tyrone, Pennsylvania. This was a sale for $25.32 in coins from the Chapmans. Courtesy Lupia Numismatic Library, Special Collection, The Chapman Family Correspondence Archive. There are numerous letters from Zerbe to the Chapmans in the Archive. He joined the ANA on July 25, 1900 and is Member No. 197. On April 2, 1900 he bought $50.00 in coins from S. H. & H. Chapman and gave them his want list. He bought and sold paper money. Fig. 8. 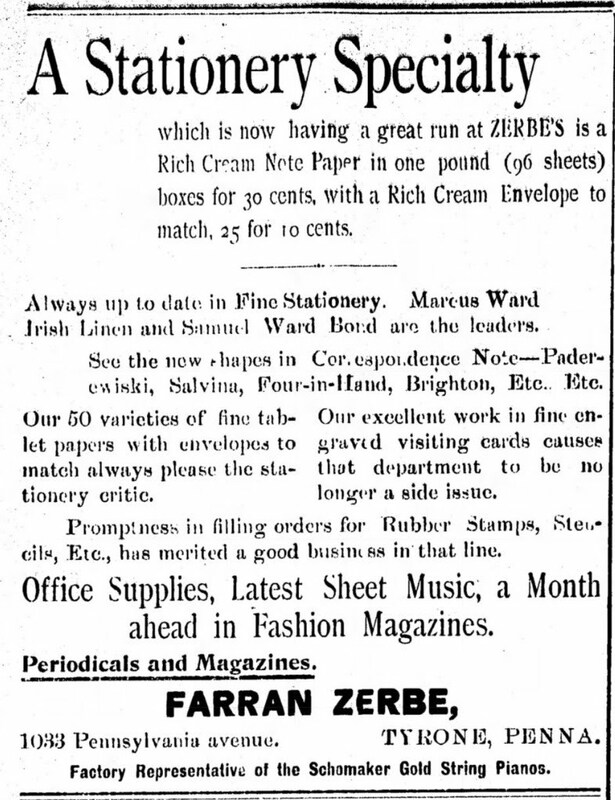 Zerbe half page advertisement in Philatelic West, January 1902, recto of the 2d leaf from the end wrapper. 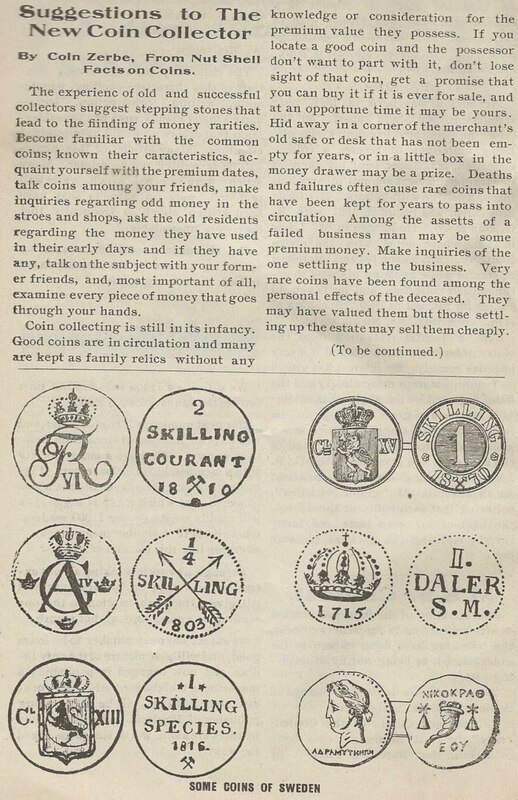 He did not advertise in The Numismatist until 22 months later and even then a very small ad. Courtesy Lupia Numismatic Library, Special Collection, Philatelic West. Fig. 9. 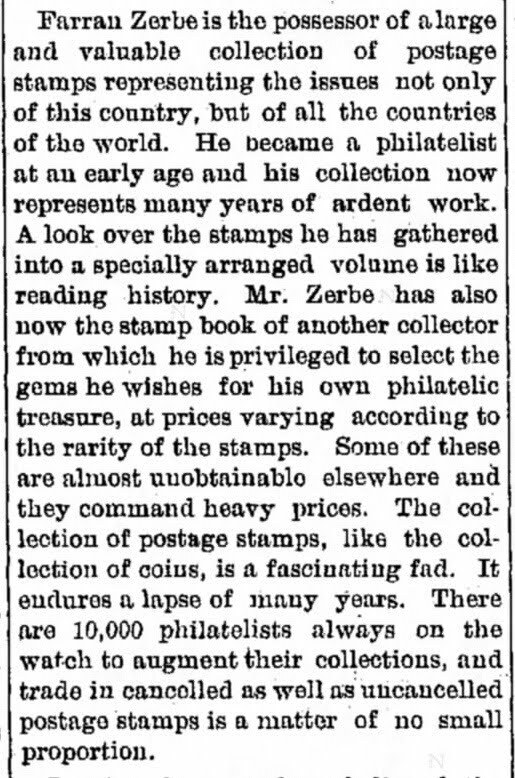 Zerbe ran a series of articles in Philatelic West in 1902, publishing portions of his 88-page book. This article above is from the February issue. Courtesy Lupia Numismatic Library, Special Collection, Philatelic West. His first advertisement in The Numismatist was a small 1/8 page ad that appeared in the September 1903 issue on page 291 for his book Nut Shell Facts on Coins, Stamps and Paper Money. From 1903 to 1904 he served as the editor of the Numismatic Department for MeKeel's Stamp Collector. Fig. 10. According to Zerbe in an interview "since he was nine years of age he has been a collector of rarities" i.e., in 1880, so ran the story in The Pittsburgh Press, Wednesday, March 11, 1903, page 6. The story relates that he was en route to Saint Louis to register for his exhibit in March 1903 proposing to exhibit a fictional billion dollar gold piece 40 feet in diameter and 30 inches thick. Many of his coins and stamps and paper money are enumerated in this must read story. In 1904 the ANA elected him as first vice-president. From that first ANA convention for him that year he would attend 27 more during his lifetime, about 71 per cent of the 38 held up to 1941 when he became too feeble to travel. He was also a member of the British Numismatic Society of London. He was also appointed chief numismatist at the 1904 "Louisiana Purchase Exposition" held at St. Louis, typically called the Saint Louis Exposition. The Exposition commemorated Thomas Jefferson's 1803 Louisiana Purchase. There he was put in charge by the U.S. Government of the sale of souvenirs being official coins and medals including the two varieties (Jefferson or McKinley) of the commemorative gold dollars of the U.S. Mint. Also, in 1904 he struck his store card FARRAN ZERBE NUMISMATIST SAINT LOUIS 1904. As a promotional gimmick as well as producing souvenirs of the Expo he issued wooden postal cards which he had copyrighted bearing images of the commemorative gold dollars. Fig. 11. A very fine specimen of the Farran Zerbe souvenir wooden postal card of the St. Louis Exposition. 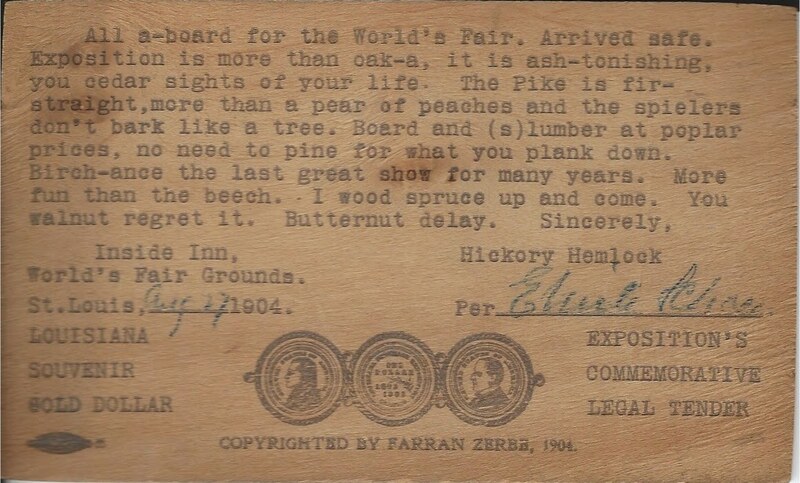 Zerbe the punster plays puns on the theme of wood and with tree names on his souvenir postal card message printed on wood. Zerbe's Louisiana Purchase Exposition Company, Incorporated April 21, 1904 printed on the rim of medal of Thomas Jefferson on the front of the postcard. Louisiana Purchase Exposition issue, St. Louis, Missouri, April 30 - December 1, 1904 Scott #323-A130, Robert Livingston, 1c Green, Scott Catalogue 2013 value for the stamp franked on an Expo card with handstamp cancel $100 for the stamp alone. I have about 10 of these in stock. If interested in purchasing one please write john@numismaticmall.com. Courtesy of the Lupia Numismatic Library. He also had Louisiana gold quarters and half dollars struck, obverse : Fleur-de-lis inscribed with one of the letters L P E on each corresponding lobe. The Fleur-de-lis surrounded on the edge by fourteen stars. The date 1904 divided with a pair on each side of the Fleur-de-lis. the Half Dollar Reverse : legend, LOUISIANA GOLD with the central design being a circle within the fraction 1/2; and the Quarter Reverse : the same with the fraction 1/4. The half dollars were 11-mm in diameter making them very delicate and smaller than the 14-mm diameter silver three-cent piece. 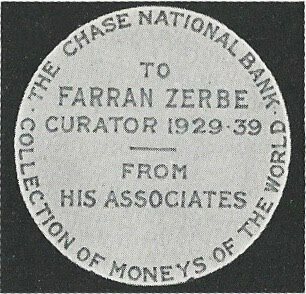 As Herbert Brand put it so well in The Numismatist, May (1958) "Farran Zerbe was eating his cake and was having it too." This position and event sent his career into meteoritic motion! Fig. 12. 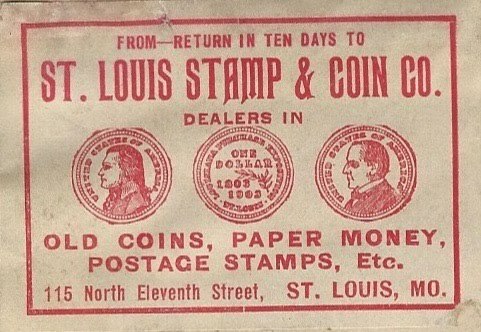 Frank Elmer Ellis (1861-1937), owner of St. Louis Stamp & Coin had special mailing labels printed celebrating the St. Louis Exposition illustrated with engravings of the souvenir gold dollars taken from Zerbe's wooden postal card. Enlargement of the label from a business envelope taken from a letter sent to the Chapman Brothers. Courtesy Lupia Numismatic Library, Special Collection, The Chapman Family Correspondence Archive. Fig. 13. Top : Jefferson Gold Commemorative Dollar. Bottom : McKinley Gold Commemorative Dollar. Both commemorative souvenir gold dollars of the St. Louis Exposition were designed by C. E. Barber. Fig. 14. 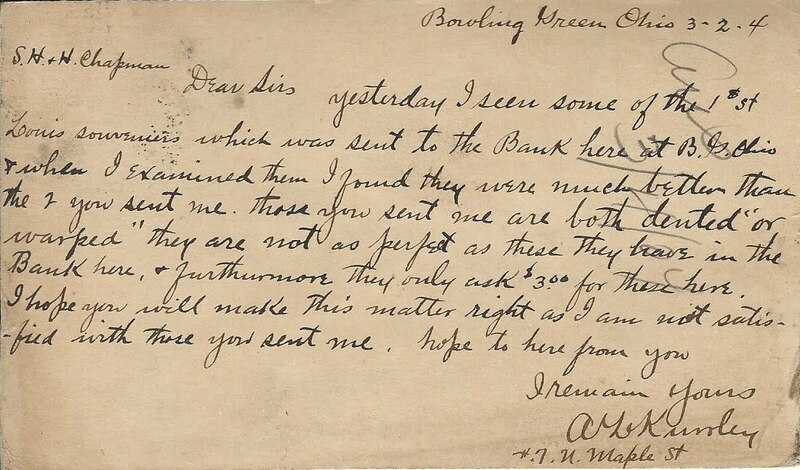 Postal Card sent by A. L. Kunley to the Chapman Brothers complaining about over priced St. Louis souvenir $1 gold pieces in damaged condition, postmarked Bowling Green, Ohio, March 2, 1904. Courtesy Lupia Numismatic Library, Special Collection, The Chapman Family Correspondence Archive. "Yesterday I seen some of the 1$ St. Louis souvenirs which was sent to the Bank here at B.G. Ohio & when I examined them I found they were much better than the 2 you sent me. Those you sent me are both dented "or warped" they are not perfect as they have in the Bank here & furthermore they only ask $3.00 for these here. I hope you will make this matter right as I am not satisfied with those you sent me. hope to hear from you I remain yours, A. L. Kunley #7 N. Maple St"
Fig. 15. Farran Zerbe's stationery for the Souvenir Coin Department, Louisiana Purchase Exposition. 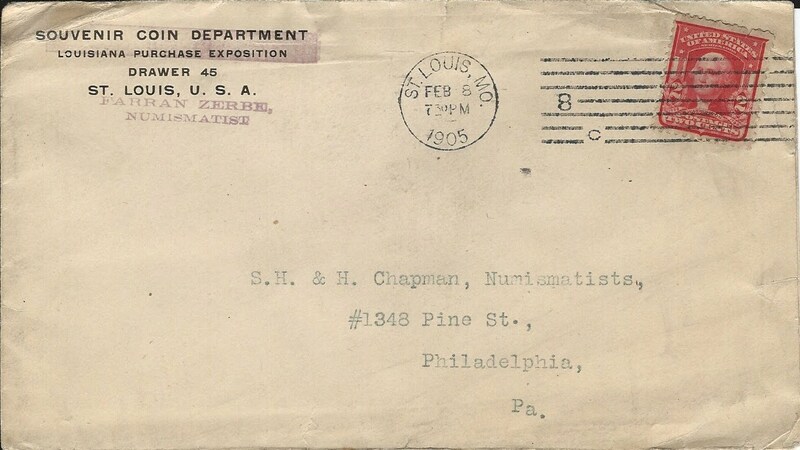 This letter postmarked February 8, 1905, St. Louis, Missouri, sent to the Chapman Brothers with invoice for $18.75 for souvenir dollars. Courtesy Lupia Numismatic Library, Special Collection, The Chapman Family Correspondence Archive. 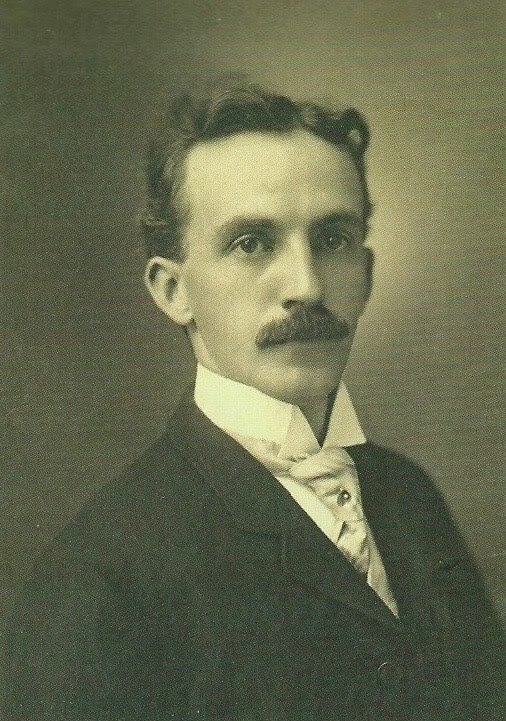 He was also the chief numismatist at the "Louis and Clark Exposition" at Portland, Oregon, usually called the Portland Exposition 1905-1906. There he was put in charge by the U.S. Government of the sale of souvenirs being official coins and medals including the commemorative Louis and Clark gold dollars. In 1905 his address was given as Box 743 Portland, Oregon when he advertised to sell Lewis & Clark Exposition souvenir post cards, stamps and coins in Philatelic West. Fig. 16. The Lewis & Clark Centennial Exposition Dollar, Portland, Oregon, 1904 and 1905 Gold Commemorative Dollar, designed by C. E. Barber. Fig. 17. 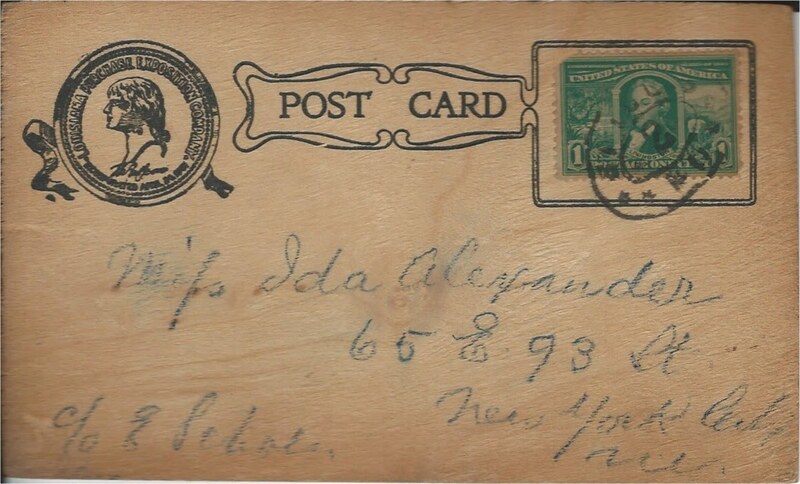 Thomas Lindsay Elder postal card to the Chapman Brothers postmarked January 26, 1906, Madison Square Station, New York. 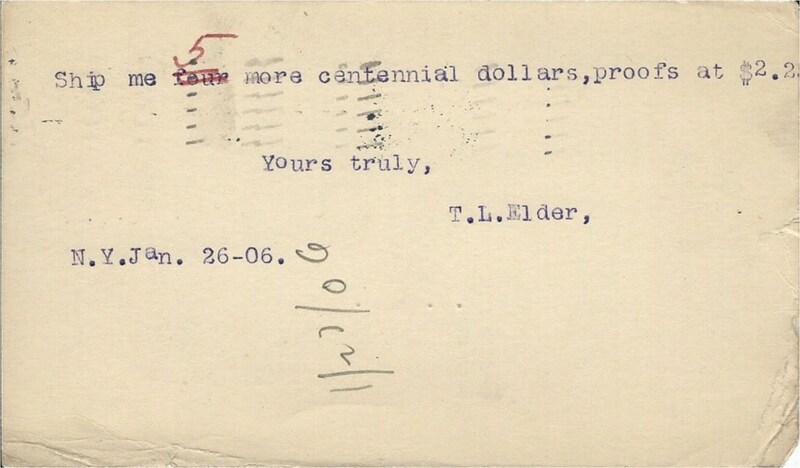 This is one of several frantic requests by Elder buying the Centennial Dollars, not from Farran Zerbe, but through the Chapman Brothers, suggesting the feud between them dates prior to the 1909 ANA presidential election. Courtesy Lupia Numismatic Library, Special Collection, The Chapman Family Correspondence Archive. Fig. 18. Photo of Zerbe as Vice-President of the ANA 1905-1906. In 1906 he was in San Francisco during the earthquake and serendipitously helped save J. C. Lighthouse's coin collection. As the story goes Zerbe begged Lighthouse to examine his collection stored in the vault at the Palace of Art. Lighthouse took the coins out and brought them to Zerbe at his [Lighthouse's] home. He spent the entire day examining the coins and very fortunately too late to return them to the vault, which the following morning was ruined by the earthquake and fire. He sent a telegram to his mother informing her he was safe, which was published in the Tyrone Daily Herald, Monday, April 23, 1906. Elaboration on the event was published in the same paper on April 26th and May 3d. In October 1906 he was the guest speaker at the first annual convention of the Ohio Numismatic Society held at Columbus. From 1906 to 1911 he was a member of the ANS. He was dropped for non payment of dues. In 1907 he was elected president of the ANA. Consequently, he served as the 7th President of the ANA from September 4, 1907-August 14, 1909. He was an itinerant exhibitor an lecturer of "Moneys of the World" 1907-1914, and 1920-1928, which terminated upon the sale to Chase National Bank. In 1907 he began the traveling exhibit circuit publishing Money Talks, as a promotional pamphlet about the exhibition given out in the various banks which held the exhibit. At these exhibitions he also gave free booklets titled Money Facts bearing the imprint of the Bank where the exhibit was held. The concept was utterly brilliant as it is vividly described by Herbert Albert Brand (1890-1962), "Incident in the Life of Farran Zerbe," The Numismatist, May (1958) : 545. "He generally exhibited at banks for a week, drew a lot of newspaper publicity, brought many people in the bank who opened accounts, made loans and in general were becoming acquainted with the services the bank offered. Of course he had the opportunity too, of buying many hoards of coins brought to him for appraisal." "While Zerbe was exhibiting in Denver Colo., at one of the banks, the banker from another bank in the city visited him and asked him if he would be interested in buying the old gold pieces that had been issued by the Mormons, the United States Assay Office and other concerns. Of course Zerbe was interested and an appointment was made after banking hours. Zerbe expected to find a half dozen or so and was delightfully shocked when the banker brought into view a fairly large canvas bag and poured several hundred pioneer gold pieces on the desk. There were Mormons, Cincinnati Mining & Trading Company pieces, 25 or more slugs and a variety of almost all of the various issues. While Zerbe's eyes were feasting on all of these and while he was pondering about raising the money to buy the lot , the banker brought out a small cardboard box filled with the 25c, 50c, and $1.00 California gold pieces. The banker wanted to know if Zerbe was interested in buying the lot and upon being assured he was, depending on the price, the banker told the story of the hoard. "Father, who had the bank before my brother and I, took these in at a discount, but he never distributed them again. This was his collection. I believe they were worth face value today and perhaps more, but if you will buy them at face, you can have the premium as your profit. I am sure my brother will agree as we have spoken often about father's hoard of odd gold pieces and have carried it on the books at face. We have both wished to dispose of it and this is the first opportunity I have had. I'll talk it over with my brother, to let him know what we are doing; you see, while I take care of the bank, he looks after the property that father left. I'll see him tonight as he is coming over to dinner and I'll let you know in the morning. Or, better, drop in after banking hours, after you have finished with your show.
. . . . . The sack of gold was not on the desk. The cardboard box of tiny gold pieces was not in sight. In 1908, he purchased The Numismatist from the estate of the late Dr. George Heath. Zerbe became the owner, editor and publisher of The Numismatist 1909-1910. In 1908, he was a member of the American Philatelic Association and gave the speech address at their annual meeting. Fig. 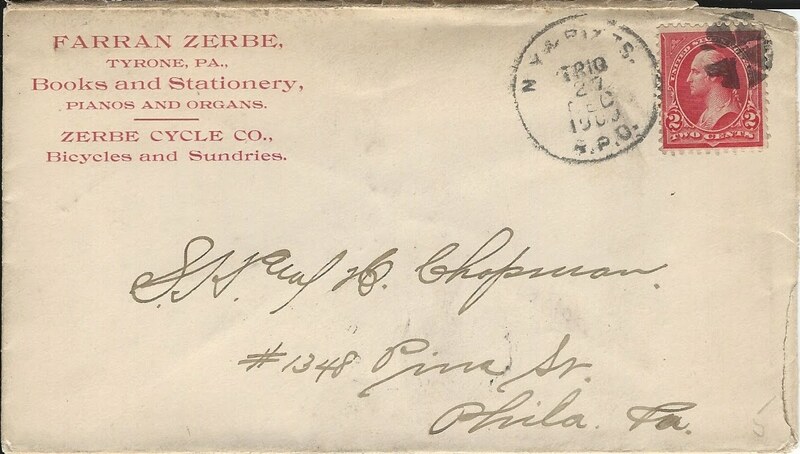 O. J. Bierly a coin dealer in Pittsburgh correspondence with Zerbe postmarked January 4, 1909. Courtesy Lupia Numismatic Library. Fig. 19. Correspondence with C. E. Kotwall, Cooper Lodge, Byculla, Bombay, India, sent on postal stationery franked with postage and revenue stamps, postmarked 24 April, 1909. Kotwall was ANA Member No. 101. Zerbe was always interested in acquiring moneys of the world and Kotwall was his source for India. Courtesy Lupia Numismatic Library. On Wednesday, May 6, 1908, he married a woman nine years older than himself named Bessie Garner Knox (1862-1935), of Freehold, New Jersey, at Trenton, New Jersey. She was 44 years old and Zerbe just turned 35 three weeks previous to the marriage. The Altoona Tribune and the Tyrone Daily Herald reported that Zerbe was living at Columbus, Ohio at the time. The romance began during the Louisiana Purchase Exposition. In June 1908 he and his new bride traveled to Cumberland, Maryland to exhibit his Moneys of the World at the Third National Bank. Fig. 20. 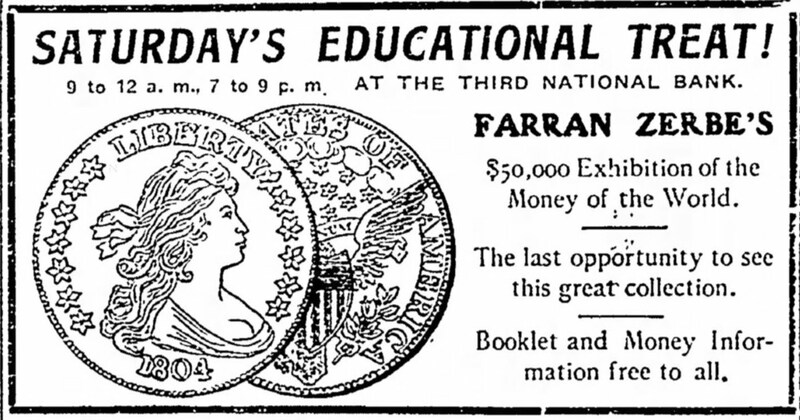 Advertisement for Zerbe's Moneys of the World Exhibit at the Third National Bank, Cumberland, Maryland in the Cumberland Evening Times, June 26, 1908, page 8. Mrs. Farran Zerbe, East Orange Public Library, East Orange, New Jersey, applied to the ANA in May and joined the ANA in July 1909. See The Numismatist, Vol. XXII, No. 5, May (1909) : 150; No. 7, July (1909) : 214. It was also in May 1909 that Farran and his wife Bessie exhibited the Moneys of the World at Cumberland National Bank, Bridgeton, New Jersey. In 1909 he was appointed to the United States Assay Committee. He was reappointed to this office in 1923. During the ANA presidential election in 1909 he and Thomas Elder were great opponents in the field of numismatics "feuding like the Hatfields and McCoys". Elder was very competitive, and unfortunately, was the original at winning by intimidation. Elder struck several medals or tokens depicting Zerbe as a jackass, which he called Zerbe a jackass with zebra stripes. 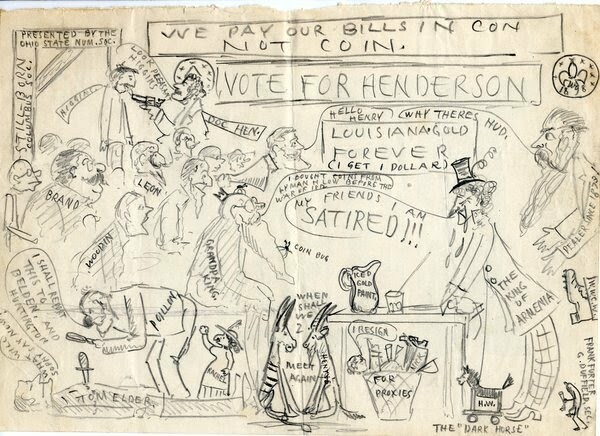 He also parodied Zerbe's Louisiana gold half dollar striking a caricatured replica with the value of 1/2 NERVE. Elder, like Mark Twain was keen at acid cutting insults. Both Elder and Twain have left a tragic legacy in this regard, when both were very gifted and talented and had much good to offer their respective fields, without leaving to posterity emblems of the dark side of man. Zerbe, on the other hand, left only good example by word and deed. In 1969, Oscar Dodson bestowed on him the title, "The Legendary Farren Zerbe". In 1983, Ed Reiter hailed Zerbe as a "Numismatic Treasure of the Highest Order." Fig. 21. Well-known Howland Wood cartoon of circa 1912 parodying the feuding during the ANA 1909 elections. Farran Zerbe the weeping top hat bearing tall figure on the right with the balloon inscribed " My Friends I Am SATIRED!!!" on his coat THE KING OF ARMENIA. Between Samuel Hudson Chapman and his brother Henry, Jr. a rectangular sign reads LOUISIANA GOLD FOREVER (I GET 1 DOLLAR) apparently jealously poking fun at the profit Zerbe made in 1905-6, totaling $16,000. Howland Wood personal correspondence, Archives of the ANS. On October 12, 1910 with a deposit of one cent paying the balance of $500.00 no later than December 31, 1910, William Walter Coulthard Wilson (1870-1924), purchased The Numismatist from Zerbe. Wilson entrusted the conveyance of The Numismatist to the ANA to Howland Wood in a document drafted and signed on letterhead of the Hotel Thorndike, Boston, Massachusetts, on October 27, 1910. He donated the magazine to the ANA as its official bulletin. Fig. 22. 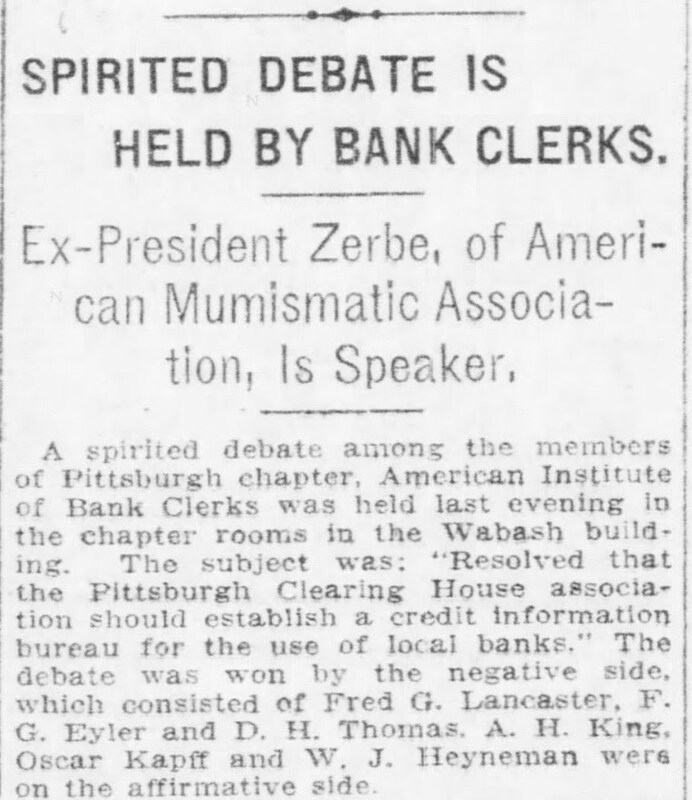 Ranked first among the most interesting headlines in Zerbe's career was citing him in thePittsburgh Daily Post, Wednesday, March 1, 1911, page 7, as the Ex-President of the American Mumismatic Association. The organization apparently stills exists and has a Facebook page for Mumismatica.com <https://www.facebook.com/mumismaticacom-304098946304671/photos> NO, I did not make this up or create that FB page. It must be the brain-child of a relative of thePittsburgh Daily Post typesetter. In 1914, the ANS awarded Zerbe a bronze Archer Milton Huntington Award Medal for his contribution of a loan of a Clark Gruber $20 gold piece for the ANS 50th Anniversary Exhibition held that year. Fig. 23 Henry Chapman correspondence with Farran Zerbe during the Pan-Pacific Fair, San Francisco Exposition, postmarked registered mail, Philadelphia, Pennsylvania, October 9, 1916. Courtesy Lupia Numismatic Library, Special Collection, The Chapman Family Correspondence Archive. In 1915 - 1916 he was appointed chief of the numismatic department of the Pan-Pacific Fair, San Francisco Exposition. The U.S. Mint produced five coins for this event : 1915-S silver Panama-Pacific half dollar and four gold coins including the $1, Quarter Eagle, and a round and an octagonal $50 Commemorative gold piece. He was given the privilidge to have struck the 19th specimen of the $50 gold piece at the San Francisco Mint. That year he founded the Pacific Coast Numismatic Society at San Francisco, California. At the time Zerbe was suffering from deep depression and was either going through a divorce or was divorced from Bessie Garner Knox. Fig. 23. 1915-S Panama-Pacific $50 Gold. Top : Round Commemorative, Bottom : Octagonal Commemorative, both designed by Robert Aitken. The Blue Book of Schuylkill County (1916) edited by Ella Zerbe Elliott, called him Professor Zerbe of the faculty of the Philadelphia High School and President of the American Numismatic Association. With a special footnote citing that he was in charge of the coin exhibition of the Panama Exposition, San Francisco, California in 1915. Fig. 24. Wilkes-Barre Times Leader, the Evening News, Monday, February 5, 1917, page 14. 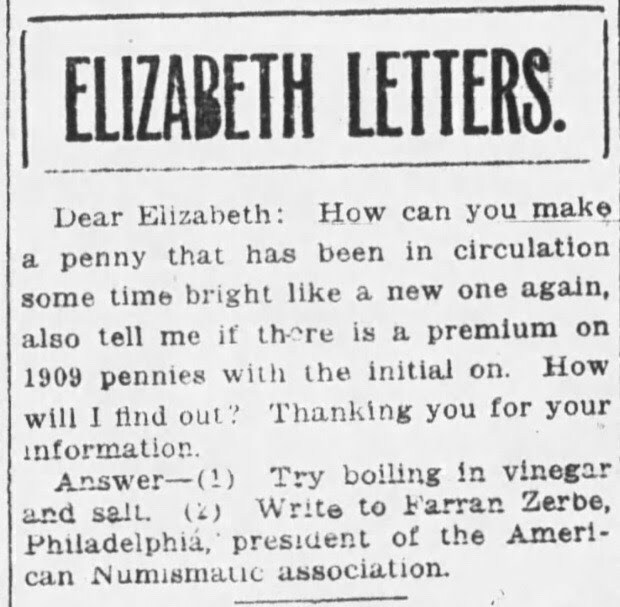 Before "Hints From Heloise" or "Dear Abby" there was "Elizabeth Letters" from 1909 to 1925. Elizabeth has a pretty interesting recipe to cook coins giving us a whole new flavor of meaning to the grade "Red" or "Red/Brown" or is it a "Medium Rare Coin"? H. O. Granberg was the president of the American Numismatic Association at the time and addressed at Oshkosh, Wisconsin b'gosh. Evidently the brouhaha Zerbe received with constant news about his traveling "Moneys of the World" exhibit which typically mentioned his ANA presidency demonstrates he was a household word and became identified both with his exhibit and former ANA administrative office even eight years after the fact. 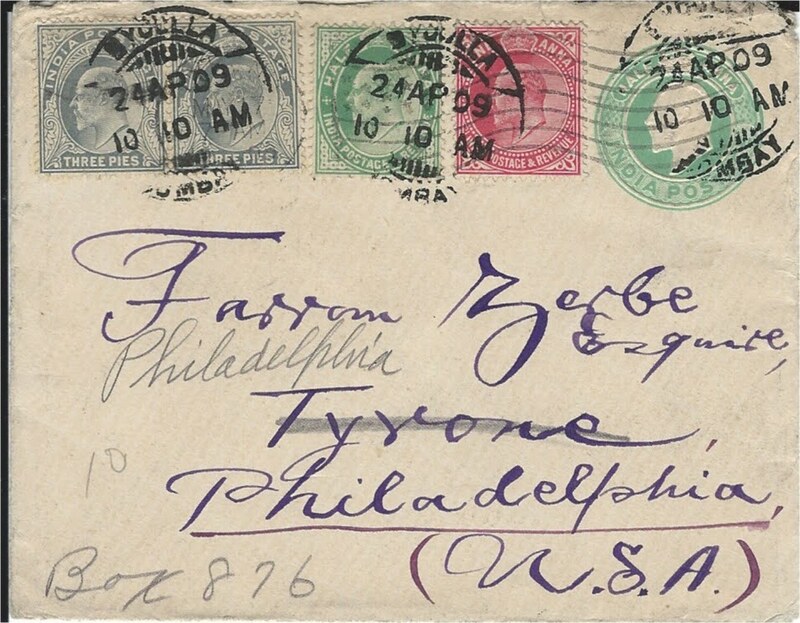 Regardless, Zerbe's mailing address was Tyrone, Pennsylvania, not Philadelphia at the time. As a former member of the United States Assay Committee a decade earlier he proposed to the United States Mint to commemorate the Era of Peace following WWI's Armistice Day, November 11, 1918, and the Peace Treaty of 1918. Moritz Wormser, Chairman of the Board of the ANA, read Zerbe's paper at the ANA Chicago Convention held August 25, 1920, appealing the U.S. government to produce a coin for America symbolizing her peace efforts. This was published in October 1920 issue of The Numismatist on pages 442-5. Through his efforts and those of the ANA Peace Coin Committee appealing to the Pittman Act the U.S. Mint produced the "Peace Dollar" in 1921 designed by Anthony De Francisci. The Peace Dollars were struck late not circulating till 1922. The last Morgan Dollars are sometimes called the Zerbe Special Strike since they are on regular planchets, and the name, as Dave Bowers astutely points out is supposedly due to his having been responsible for putting them into circulation. There is an unsupported claim that Zerbe received two dozen proofs of the last Morgan Dollar. However, the 1921 Morgan Dollars proofs are most probably the result of the influence of Henry Chapman, Jr., at the U.S. Mint who had a few of them struck, not Farran Zerbe. That is why there are no so-called Zerbe Special Strike in genuine proof condition. Zerbe's seminal work on the "Lesher Referendum Pieces" was published in the American Journal of Numismatics Volume 51, 1919. Without permission or consultation whatsoever B. Max Mehl reprinted this work in his own periodical, Mehl's Numismatic Monthly, May issue, setting off a private war. Both the ANS's and Zerbe's good nature quickly forgave the peccadillo of Mehl who was earnestly contrite. He was also a member of the ANS, the president Pacific Coast Numismatic Society from 1918 to 1923; and a founding member in 1908 of the New York Numismatic Club, and also a member of the Tyrone Club. In 1923 he rejoined the ANS. In 1924, Zerbe instituted "National Coin Week". In July 1926, Zerbe published his chef d'oeuvre, a profusely illustrated seventy-page essay in The Numismatist listing over 140 different medals and tokens partially relating to the Bryan Satirical Pieces during Bryan's Campaigns of 1896 and 1900, some of which are called the Bryan Money and Bryan Dollars. In 1928, he sold his traveling "Money of the World" collection and library to Chase National Bank, New York, forming The Chase National Bank Collection of Moneys of the World Museum and as its founder being appointed the museum's first curator. Among the more notable American coins were Willow, Oak and Pine Tree New England Shillings of 1652, an 1804 U.S. Silver Dollar, a 1792 patter quarter dollar, and a 1709 Colonial Bill of Credit of New York printed by William Bradford. In 1955 when the bank merged with the Bank of Manhattan to form The Chase Manhattan Bank the museum name also changed to The Chase Manhattan Moneys Museum. It moved to the Rockefeller Center Tourist Complex. By February 1978 the Chase collection was loaned to the Smithsonian. THe ANS was slated to receive some of the rare coins including the 1804 Silver Dollar. But in December 1979 the Zerbe-Chase Manhattan Collection was gifted to the Smithsonian. Also, in 1928, Zerbe was elected Chairman of the Board of the ANA, and was made a Fellow of the ANS. May 13, 1929, the official date of the Chase Moneys of the World Permanent Exhibition open to the public at 4 Cedar Street, New York City. On August 6th of that year he was appointed the legal guardian of his nephew Farran Zerbe II, son of his brother Charles Francis Zerbe. In August 1930, he was a charter member of the Cincinnati Numismatic Association. On September 10, 1932, he married Julia Gertrude Mahoney (1886-1957) from Peabody, Massachusetts. In August 1933 he sailed aboard the SS. Washington to Southampton, England. On May 30, 1936 they sailed on the SS. Pennsylvania from New York to San Diego, California, arriving there on June 12th. In August 1939 he retired as curator of The Chase National Bank Collection of Moneys of the World Museum . Fig. 25. 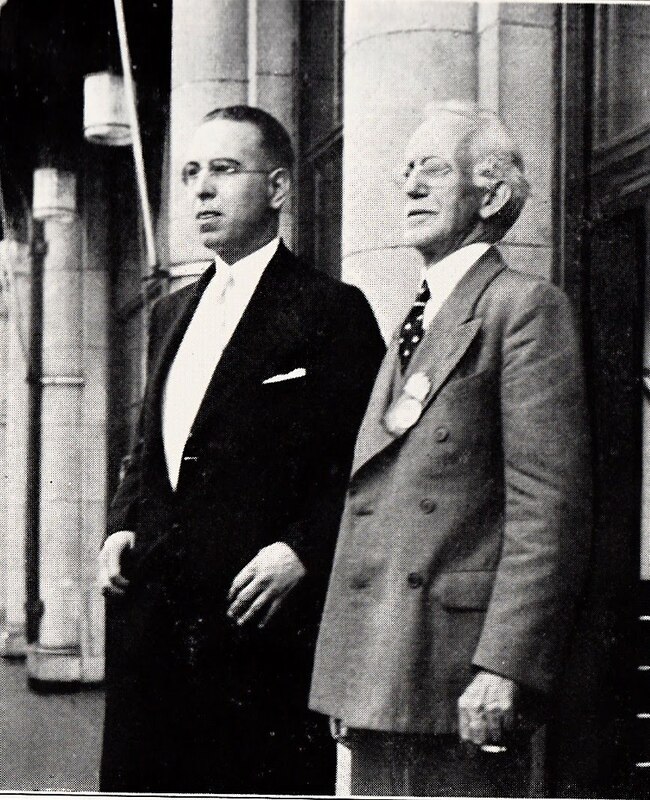 Farran Zerbe with Vernon L. Brown in 1939 in front of the Chase National Bank, New York. Was Zerbe left handed? His successor was Vernon L. Brown in 1939, who was hired by him in 1931. The following year Chase National Bank presented him with the Chase National Bank Silver Medal Award. The souvenir tokens of the same obverse design that sold at the Bank Exhibit were brass. Fig. 26. 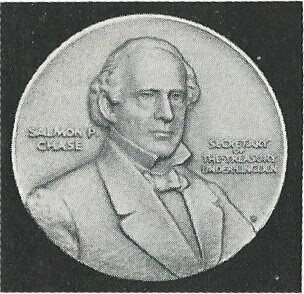 Samuel P. Chase Silver Medal awarded to Farran Zerbe on the first anniversary of his retirement in August 1940. The medal designer John Ray Sinnock (1888-1947), gave Mr. Chase a striking resemblance to Sir Cedric Hardwicke, who the year before starred in three American films. Fig. 27. 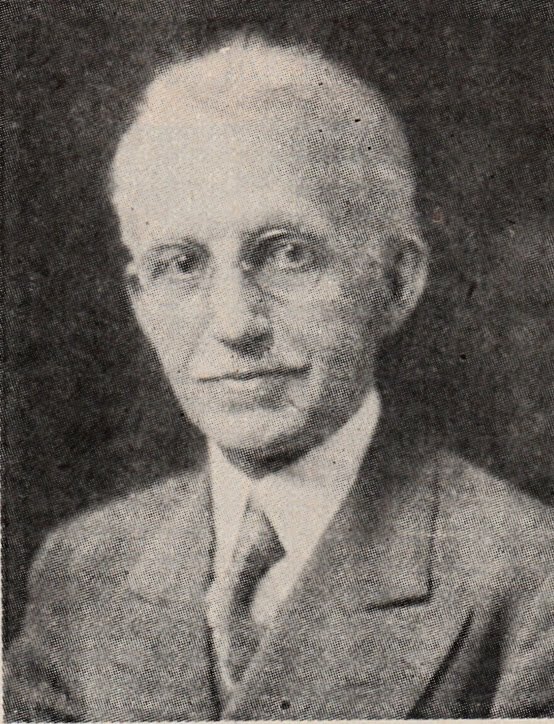 Photo of Farran Zerbe in 1941 the last year he attended an ANA Convention held that year in Philadelphia, The Numismatist, February, 1950, page 87. In 1944 he was awarded "Honorary Membership of the ANA" for his dedication, contributions, and service to the field of numismatics . He served as the Historian of the ANA during his final years until his demise. He fell ill in October 1949 and was confined to bed. He died at New York, on Sunday, Christmas Day, December 25, 1949, just a few months short of turning 79. He was survived by his second wife Julia Zerbe, and two brothers : Charles (1877-1950), and Jonathan (1879-1958). Prior to his becoming bedridden he was slated by the ANA to receive the "50 Year Gold Membership Award" in August 1950 during the ANA Annual Convention scheduled to be held at Milwaukee. Jack W. Ogilvie, ANA Historian, wrote Zerbe's obituary hailing him just six months after his demise the "Dean of American numismatists" in his eulogy in the June 1950 issue of The Numismatist. This was the second time the ANA formally bestowed that hallowed title on a great numismatist within the pages of The Numismatist. The first time was in 1945 for Henry Chapman, Jr., nearly twelve years after his death. Zerbe never cared about praise for his research and work and from this spirit of modesty submitted many articles for publication in The Numismatist signed by a pseudonym, being a punster "one of his favorites being "Portuguese Joe". The double entendre pun referring to the character in Robert Louis Stevenson's In the South Seas, and numismatically the famed Portuguese Johannes series of gold coins (1722-1835), commonly called a Portuguese Joe. The ANA Annual Award, the highest honorific conveyance of the ANA was named the Zerbe Memorial Award in his honor announced in the February 1952 issue of The Numismatist on pages 150-2. It was founded in 1951 by Louis S. Werner of New York, a very dear and close friend of Zerbe who was with him until his death. The ANA imposed additional qualifications requiring the nominee should be a former Medal of Merit and Glenn Smedley Memorial Award recipient. The Zerbe Memorial Award is limited exclusively to members of the ANA. The first recipient was M. Vernon Sheldon ANA LM 58 in 1951. He was inducted into the ANA Numismatic Hall of Fame in 1969. A tribute to his solemn memory were published in The Numismatist that year written by Oscar Dobson. Perhaps because Herbert A. Brand's tale about the Denver, Colorado, banker's gold hoard is not verifiable it was not included in Dave Bowers, American Coin Treasures and Hoards. The story is very exciting and amusing but it just might be a fish tail. Lesher Referendum Pieces, American Journal of Numismatics Volume 51, 1919. Tyrone Business Directory (1893) : 487. The Washington Times, Saturday, February 6, 1904, page 5. Announcement about his being in charge at St. Louis Worlds Fair. Philatelic West, Vol. 31, No. 1, September (1905) almost quarter-page ad on 3rd leaf at the back of the magazine. H. A. Brand, "Incident in the Life of Farran Zerbe," The Numismatist, May (1958) : 545. Don Taxy, "Taxy Recalls Chase's Money Museum," Coin World, Vol. 19, Nos. 935-937, March 15, 21, 27 (1978) : 1ff, 40ff, 38ff. Charles Logan, "Redistributing the Chase coins : the final chapter on one of the great all-time collections," COINage, Vol. 14, No. 4, April (1978) : 58ff. Ed Reiter, "Farran Zerbe : Coin Collecting's Forgotten Man Was "Numismatic Treasure of the Highest Order," Numismatic News, Vol. 31, No. 33 August (1983) : 10ff. Charles Davis, American Numismatic Literature, No. 1207.